These objects promise to lift up the faithful to a higher power. Unless you majored in religious studies, your knowledge of spiritual practices could be as limited as ours. (Rosary beads hang from your rearview mirror to get all green lights, right?) We asked a handful of religious folks how certain objects are used to facilitate their various faiths. 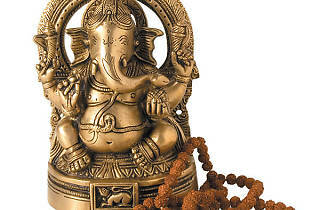 Hindus often set up a meditation shrine, where a picture or statue of a deity such as Shiva, Vishnu or Ganesha (pictured)—all of whom represent the one formless God—helps practitioners focus their thoughts on God, according to Swami Varadananda, assistant swami at the Vivekananda Vedanta Society. 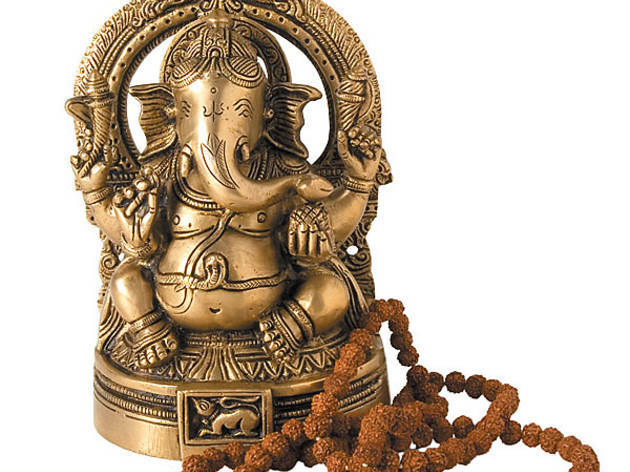 Using a mala, or a string of prayer beads, to keep count, Hindus recite a mantra in repetitions of 108—100 times for one’s self and eight times for the good of the world. Tefillin, or phylacteries, are a literal interpretation of the Torah commandment instructing Jews to place a sign on their arm and between their eyes in honor of their devotion to God. Parchment paper inscribed with this biblical verse fills two leather boxes. During morning prayers, one box is worn on the head and the other on the hand, both secured with leather straps. “[Tefillin] remind us to keep the love of God present in our thinking and transform those ideas into action,” Anshe Emet Rabbi Michael Siegel says. We see these colorful religious candles all over Pilsen and Ukrainian Village—even the Mexican food aisle at Jewel-Osco. Their purpose? “You’re not praying to the saint but asking the saint for his or her prayer,” says Todd Williamson, director of the Office of Divine Worship for the Archdiocese of Chicago. Certain saints are affiliated with certain causes; Saint Peregrine is the patron saint of cancer patients. The prayer continues for as long as the candle burns in the home or the church. Ojuzu, which some Buddhists consider a precursor to rosary beads, represent the 108 blind passions, or the ways in which we judge the world based on our experiences and senses. “We want to see [things] in a way that’s acceptable to our ego,” says Midwest Buddhist Temple’s Rev. Bryan Siebuhr. Rather than using them to keep count, the beads—in strands of 108 or abbreviated versions worn on the wrist—remind us to strive for nonattachment and wisdom. Yes, Wiccans do cast spells, but not by using eye of newt. Rebecca Petersen, a practicing Wiccan and teacher of European witchcraft at Occult Bookstore, explains that spellwork often involves lighting candles or filling a charm bag with things like herbs for wisdom or drops of oil for illness. “You empower [the bag] through a ritual and a chant devised for that working.” Wiccans typically make their own bags using fabric in prayer-specific colors (blue for healing rituals, for instance).